A fine set of three Thai ceramic figures, Sawankhalok Celadon glaze, dating to 14th.-15th. century AD. Interesting 'Mother' figures types but two are holding animals and the third the baby. Size: Between 11,5 cm. and 9,5 cm. 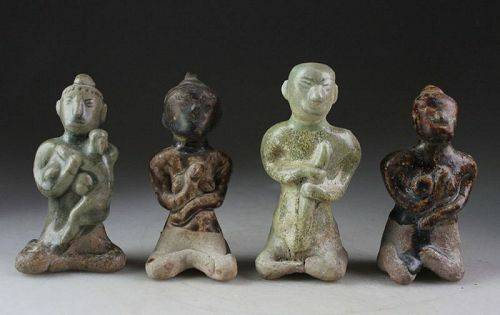 Four Thai, Thailand pottery fertility Figurines, 15th. century! A scarce lot of no less than 4 Thailand, Sukhothai, fertility figurines, ca. 15th. century AD, with some earlier ones perhaps. A fine lot with all different male and female figurines in brown and celadon glace. Condition: Choice, 3-4 heads ritually attached in the burial as usual for the fertility idols, now professionally restored so that the repair is difficult to spot. Nice Antique terracotta Buddhist amulet/tablet from Burma or Thailand with detailed Buddhist figures in relief. Size: 5,5 cm. wide and 5,3 cm. high. Rare Jar with animal head Khmer-Thai Empire, 11th.-12th. Cent. A very interesting large Jar, Angor Period, Khmer Empire of Nord-East Thailand, 11th.-12th. century AD. The jar sculptured with an animal head or face on one side of the vessel. Beige colour of glaze and the typical spout for the period. Size: ca. 17 cm. high and 12 cm. wide. Ex. Danish Private Collection of Thai and Khmer pottery. Ancient javanese Majapahit terracotta head, ca. 12th.-13th. century. A large head of a female deity, finely sculptured with an elaborate headdress and earring. The style is very good and an interesting motif. Who was this deity?. Size: 72 mm. x 65 mm. Condition: Choice! The head is basically intact and thus rare. Ex. Old Danish Collection, bought in the 1960s in London. Fine Early Javanese terracotta head, 10th. cent. Chinese man!! FINE EARLY JAVANESE TERRACOTTA HEAD, c. 10-12th century AD. Extremely interesting fragment of a Chinese trader, note the Chinese round face, the eyes and the peculiar knot of hair on top of the head. The sculptural quality pottery head documents the rich trade between the Chinese Empire under the Sung Dynasty emperors and South East Asia. Ancient javanese Majapahit terracotta head, ca. 13th. century. Finely sculptured by a true artisan. The full head of a woman, or perhaps a female deity, with an elaborate hairstyle and headdress. Her ear rings are very large. Size: 70 mm. x 50 mm. Condition: Choice! The head is basically intact and thus rare. With a small hole drilled in the base, so that it's very easy to mount. FINE LARGE EARLY JAVANESE TERRA COTTA HEAD, c. 13th century AD. The head of a deity, done in a wonderful style with a very large earspoil! Note the serene expression, Majahapit art can compare in quality with the classical pre-columbian art and the early Ásian Buddhist art. 70 mm. high and nearly 65 mm. wide..